Four HepsNation rookies competed on Friday in the International Triathlon Union (ITU) World Triathlon Series Championships in Cozumel, Mexico, and these athletes will return to their college campuses with medals and top 10 finishes in their respective events. 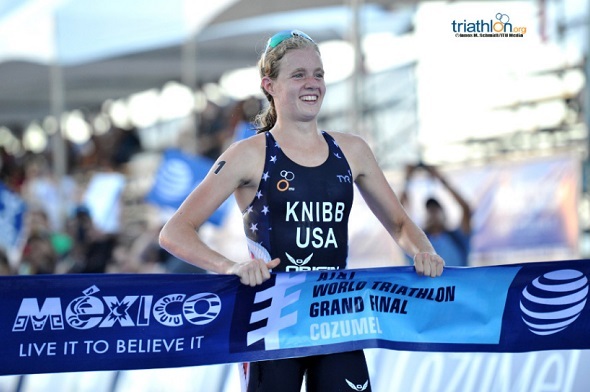 Cornell freshman Taylor Knibb (Washington, D.C.) entered the world championships as the defending ITU world silver medalist, the 2016 ITU Triathlon World Cup bronze medalist, and the two-time reigning American Junior Elite Champion. She was a favorite for the gold medal before the gun went off. By her own admission, she didn’t have the best swim of her career as she left the water almost 50 seconds back of the leaders after the 750m swim. She stayed patient though, and with a strong 20km bike ride, she entered the second transition with a 34 second LEAD. She extended her lead on the 5km running portion and went to claim the world title in 59:05. Joining Knibb as a world medalist is Harvard freshman Lisa Tertsch (Darmstadt, Germany). Tertsch came out of the water a second behind Knibb, and like Knibb, advanced on the field during the biking stage. Going into the run, Tertsch was sitting in third place, eight seconds behind second place and a total of 42 seconds back of Knibb. Tertsch yielded the fastest running portion of all of the athletes (17:56 for the 5km) to finish second overall in 59:41, 39 seconds behind Knibb. This is Tertsch’s first world medal as she is a two-time medalist (gold and silver) on the European championship scene from earlier this year. Knibb had a fellow Big Red teammate in the event, as Kyleigh Spearing (Frankfurt, Ill.) also represented Team USA. Spearing finished ninth overall in 1:00:16 as the second American finisher in the race. Spearing was ahead of Knibb and Tertsch after the swim by about a step or so, and sat in seventh place by the end of the bike portion. Spearing had finished fourth in the USA Junior Triathlon Championships in July. Oliver Blecher was the lone Heps man competing in Cozumel. The Brown freshman from Port Hope, Ont. – seen right – had previously won silver and bronze medals earlier this season on the European circuit and was looking for a medal on the world stage. He had a very strong 750m swim as he was in second place coming out of the water and onto the 20km bike portion. Unfortunately, he lost ground during the bike stage as he had only the 21st fastest split in the field. He made up significant ground during the 5km run, where he battled back and finished in sixth place overall with a time of 54:28. USA’s Austin Hindman won the world title with a time of 54:02. This entry was posted on Saturday, September 17th, 2016 at 12:00 am. It is filed under Athletes, Spotlight. You can follow any responses to this entry through the RSS 2.0 feed.